We have a team of more than 200 fundraisers whose infectious energy and passion helps bring in millions of pounds each year. The money they raise is converted into funding for brilliant scientific minds, essential lab equipment and support for pioneering research projects. Our fundraising activity is all about engaging with our loyal supporters and reaching out to new audiences. And each year, we raise more than £100 million. If you’re a natural born fundraiser, then the British Heart Foundation is somewhere you can amass a wealth of experience. You might be pitching to business magnates, coming up with creative ideas for a flagship event, or setting up partnerships with the potential to raise millions. From philanthropy and direct marketing to legacies and mass participation, we have roles for every stage of your career. It’s an incredibly exciting time to be part of our fundraising team. We are more ambitious and determined than ever - because the cures and treatments we need are in sight. You could be part of getting us there sooner. I use marketing to recruit runners to take part in third party events to raise money for the BHF. Then I keep in touch through their journey to make sure they feel supported. 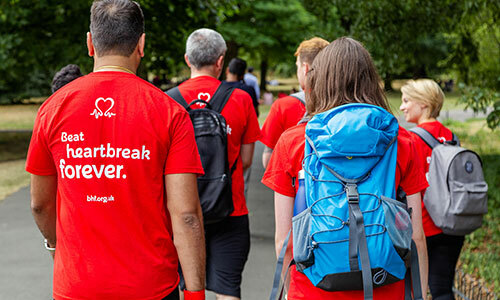 I also work with the event organisers – such as the Royal Parks Foundation Half Marathon – to coordinate the BHF’s presence at events, such as our cheering points and runners’ recovery areas. Meeting our incredible runners. Many are running and fundraising in memory of a loved one or to give something back after their own treatment. Often they tell me their stories at the finish line of a race, when emotions are running pretty high. To me, there’s nothing more inspiring and motivating. I began life at the BHF as an intern. It was a fantastic opportunity to gain some valuable experience in the sector, at one of the UK’s leading charities. I was already aware of some of the BHF’s great work and the role seemed interesting, as well as offering a level of responsibility I didn’t expect from an internship. I now manage the Heart Pioneers programme for philanthropists who donate to the BHF each year. The role is a combination of marketing and relationship management. On the marketing side, I create a variety of appeal mailings, acquisition campaigns and project updates. The relationship element involves keeping in touch with our Heart Pioneers, whether that be for a casual chat over coffee or at some of the exclusive events. What are the best things about being part of the BHF? It’s a great place to work both professionally and socially. There are a lot of opportunities to learn new skills, whether they are related to your specific job role or not. It’s very social, with lots happening after work where you get to meet colleagues that you might not necessarily interact with during office hours.